Social enterprise as a discipline and practice is so new that many aspiring entrepreneurs don’t know where to begin. They can now find their way thanks to a new guide stocked with advice from the field. 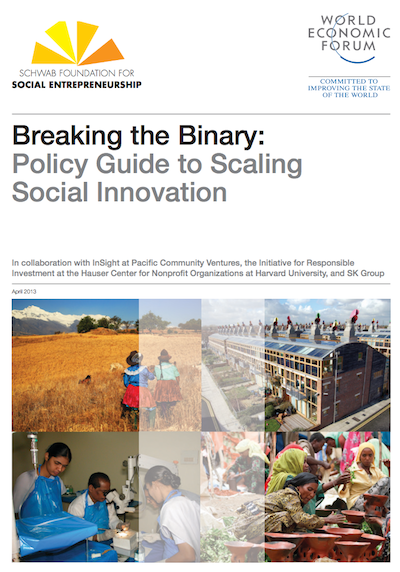 “Breaking the Binary: Policy Guide to Scaling Social Innovation,” recently published by the Schwab Foundation for Social Entrepreneurship, is a how-to on innovation geared toward social entrepreneurs and policymakers looking to improve their organizations. It profiles 12 government programs and 20 nonprofits working on the cutting edge of innovation, organizing them according to six broad categories of innovation. Because social enterprise is so new and untested, the guide highlights success stories and encourages readers to think about how to modify these solutions for their own context, as well as to apply business practices to their operations. Prove that it works more than once. Measuring the impact of pilot projects is universally popular, but Waste Concern’s Iftekhar Enayetullah said it’s not enough to get good numbers from one place: “Unless you can prove a concept in different locations, it is very difficult to scale up. The biggest lesson we learned … is that you have to invest a lot of time on the proof of concept. During that stage, it’s very important for private companies to be more than investors – they need to be real partners and to interact frequently with you and with the regulators.” Uganda-based Waste Concern has two revenue streams: selling organic fertilizer to a large company that markets, distributes and sells the product to more than 100,000 farmers across Bangladesh, and selling carbon credits to the Asian Development Bank under the Clean Development Mechanism of the Kyoto Protocol. Use your products to connect emotionally. “To educate people and help them improve their quality of life, you need to connect emotionally with them,” said Cinepop’s Ariel Zylbersztejn, whose organization uses free movie showings as a way to educate and organize hard-to-reach communities. “People love to participate in our platform because they have fun … and [we] know that 3 out of 10 people who participate in our events change their habits or behaviors.” In other words, your beneficiaries aren’t just clients; they’re humans too. It’s not all roses, however. Serious legal hurdles have stifled progress, because government regulation often fails to keep up with the pace of innovation. Most countries do not even have a legal classification for social enterprises, and without a larger infrastructure, including government support systems, social enterprises can have difficulty surviving. Sometimes, social enterprise takes the lead in building partnerships. For example, Brazilian think tank Imazon approached the local government promising to document illegal deforestation as evidence to help authorities enforce laws barring clear cut practices. In other cases, governments must choose the social issue for social enterprises to work in and funnel money so that the initiatives get the backing they need. For example, the Ghanaian government created a trust fund in 2004 that has channeled more than $14 million in aid money to kickstart microfinance funds and grow local businesses. This guide is a practical tool because it offers recommendations based on experiences in the field — a highly valuable resource for any social innovator. This article was originally published on Global Envision, a blog site focused on market-based solutions to poverty that is managed by Mercy Corps, a NextBillion content partner.